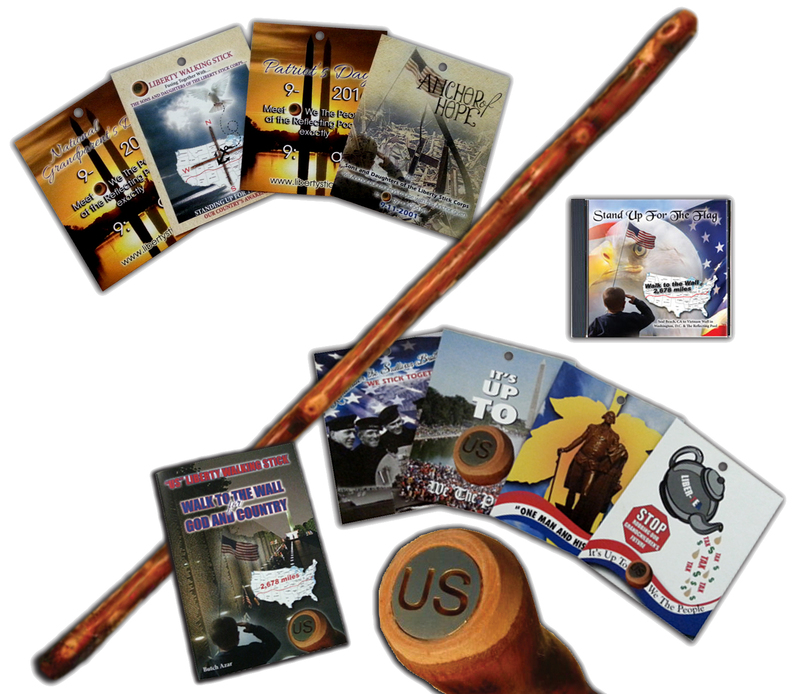 The "US" Liberty Stick started August 28th 2010, and will climax on 9/11/2016 at 9:11 am on a Sunday which is National Grandparents Day and Patriot Day all wrapped up as one day. After you read the story below, you will see that God is in control, and when He instructs.. "US"... We the People should listen. My wife Patti and I went to the Vietnam Wall, and I traced a name off of the Wall, Michael Bryant Snyder. Mike was a friend of mine who had lost his life in Vietnam. 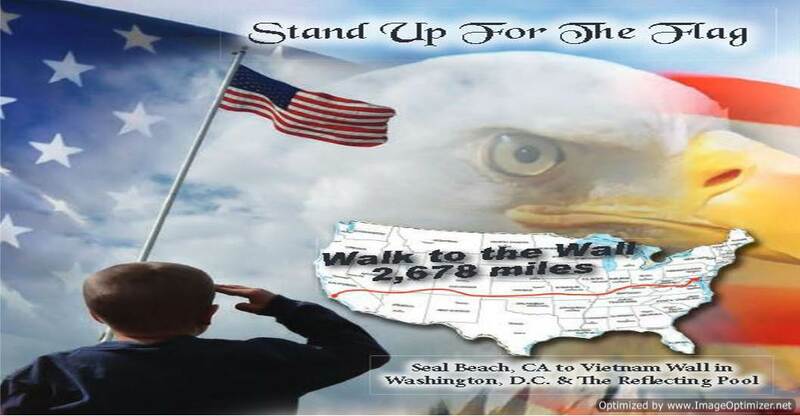 Please understand that this Walk to the Wall is in Honor of all Military Men and Women and Patriots. who have ever given the ultimate sacrifice their lives for... "US"... Remember all of them who have been wounded in battle for..."US"... Remember their families they are..."US"... 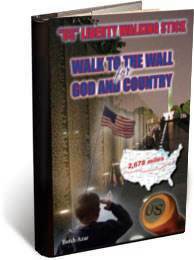 I will meet you at the Wall at sunrise and all of ..."US".. We the People... will... Stand up for the Flag. Patti and I walked over to the Restoring Honor Rally that Glenn Beck was hosting at the time at the Reflecting Pool.You can go to the image galleries on this site and see for yourself. This is God's doing, I am just a man, and He is using me, through my spirit, to do this undertaking. Glenn started speaking, in his speech he mentioned "Moses" and the "Pharaoh", he mentioned the "Stick of Moses" and the "Power of the Stick" against the most powerful man in the world at that time "Pharaoh"... (The Government). After hearing this, the seed was planted for the "US" Liberty Stick. 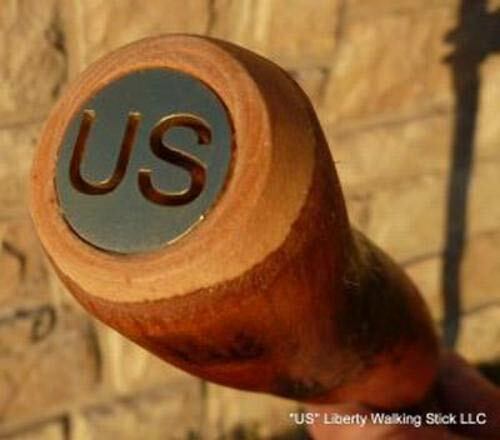 After returning home I started on the "US" Liberty Stick project. I had been out of work for sometime, and was moving along with the project. We live in a rural area in the Missouri Ozarks. A mountain lion had attacked a neighbors horse, and while I was on the computer one day, our horses and dogs went hysterical outside. I went outside with my rifle to see if I could spot the mountain lion, I could not, after 20 minutes went by the animals calmed down, so I went back inside. I went back to the computer, and the screen was black, so I hit the enter button, and miraculous is the only way I can put it, this is what was on my screen. Please understand that I was not looking for this, but there it was. In 1790 George Washington's close friend Benjamin Franklin died. In Franklin's will, He bequeathed his Walking Stick . "I bequeath my fine crab-tree walking stick, with gold head curiously wrought in the form of the cap of Liberty, I give to my friend and to the friend of mankind, General Washington. If it were a scepter, he has merited it, and would become it." I thought wow, I can make a card, and hang it off of the "US" Liberty Stick, I did, you can see it on the Image Galleries on this site under Restoring Honor Cards. Two weeks went by and my brother-in-law Tim and his wife were over having dinner with us.He saw on some paperwork what you have just read above. After reading it he said, I know Ben Franklin, and I said laughingly, yeah you knowBen Franklin.He became very excited and told me that Ben was the 7th Generation Grandson of our founding father Benjamin Franklin, and that he lived in Sullivan Missouri, which is about 20 miles from me. I said no way Tim, he responded with, Sandy his wife, cuts Ben's hair and his wife's hair . I then asked Tim if he knew him very well, he said he did, and would try and reach him on the phone, so I could be properly introduced to him. Two months went by and Tim was having no luck getting in touch with Ben Franklin. So I put Ben Franklin on hold on the back burner of my brain. I was still out of work when one morning the phone rang. It was a man that I had worked with many years ago. He asked me if I was looking for a job, he proceeded to tell me that Bourbon RV had just changed ownership, and he had mentioned me to the new owners. I went the following morning and was hired. I was there one week, had my office set up, and ready to sell RV's. The owner's hired another salesman who I was getting to know in my office. I was telling him all about the patriotic Liberty Stick, and what you have just read above. When I finished telling him, he said to me, well I have a patriotic song . I said you do, what is the name of your song, his response was Stand up for the Flag. I was sitting at my desk, and threw my hands up, and said well sing it for me. I didn't think that he would sing it, but he did, all 4 minutes and 7 seconds of it. Unbeknownst to me the song Stand up for the Flag,was all about a wounded soldier. This song moved me so much that I had tears flowing down my face. I then told him that I didn't believe in coincidences, I know that God has just put you in my path, and the song Stand up for the Flag and the "US" Liberty Stick was a perfect marriage made in Heaven. We agreed with a hand shake that the Stick and the Song would become synonymous with one another. He then said I need to smoke a cigarette, so we went outside on a little deck that wrapped around the building. We were talking getting to know each other better when a truck pulled up, and the man rolled down his window, and he told us that he was there to pick up his pop -up . I told him where it was, and he was pulling away ,when Dwight asked him his name, his response was Ben Franklin . Both Dwight and I took a step backwards toward the wall of the building when we heard his name.So in approximately the span of 6 minutes of my life God delivered to me the song Stand up for the Flag, and put in my lap Ben Franklin the 7th Generation Grandson of our Founding Father Benjamin Franklin. God was working but it His timing not ours. A few years had gone by, and I was on a float trip with my wife and family on the Current River in Missouri. I had gone to God in prayer, and I remember saying that I was in a quandary, and I didn't know which way to go with the Liberty Stick. The still small voice of God delivered these thoughts to me. WALK to the WALL! I thought that is where it started ,the only thing that I didn't know yet was, when was I suppose to start this Walk to the Wall? Another year was approaching and I decided at the beginning of 2015 that I would start my Walk to the Wall in January of 2016. I had called my cousin who lives in California, and asked him if he could think of a place close to the ocean that I could start my Walk to the Wall from .Sunny is a Vietnam Veteran and his response to my question was Seal Beach California. So I now knew where I was going to take off from, but I didn't have the arrival date worked out in my mind yet. I first considered July 31st, 2016 which is my 69th birthday. My next thoughts were maybe August 28th, 2016 which is a day Glenn Beck uses as a special event day. I was wrestling with these two dates for 11 months and 23 days. I received my answer in the early morning hours of December 23rd, 2015. I was meditating in prayer when the still small voice of God came to me loud and clear 9/11/2016. I got up a walked over to the calendar because I wanted to see what day it fell on. I had three surprises waiting for me on the calendar that morning. The first surprise was 9/11/2016 falls on a Sunday. The second surprise was that9/11/2016 is also National Grandparents Day, and God's icing on the cake was 9/11/2016 is Patriots Day. This is when I am suppose to arrive at the Vietnam Wall, and the Reflecting Pool, in Washington D.C. I am suppose to arrive at the Wall at Sunrise on 9/11. I am suppose to go to the Reflecting Pool and throw the Anchor of Hope that was given to "US" We the People on 9/11/2001 symbolically back to Him at exactly 9:11 am. You can go to the Image Galleries on this site to see the Anchor of Hope card, just click on the Restoring Honor Cards. There is one more card that is being made as I write this. 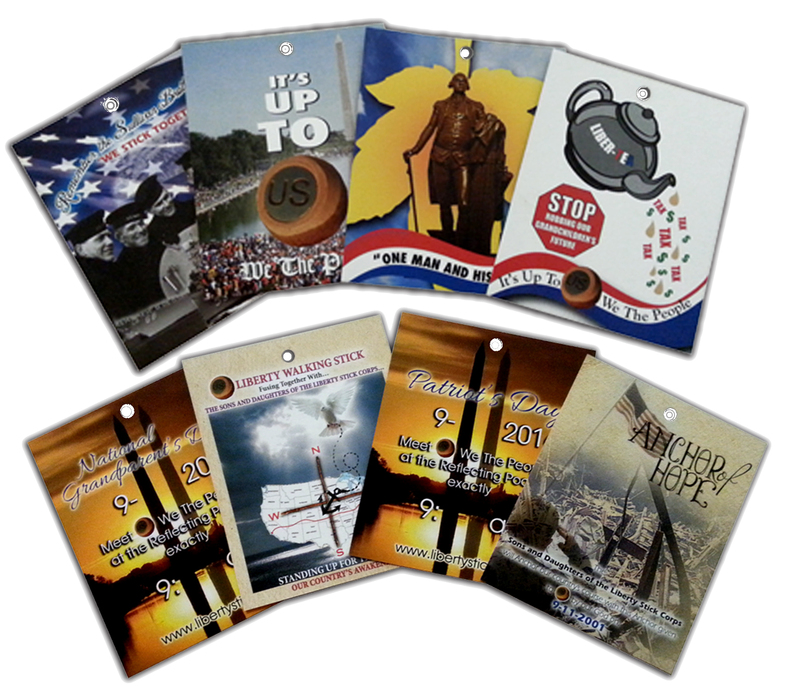 so there will be a total of 7 Restoring Honor cards that will hang from The "US" Liberty Stick on 9/11/2016. The last card is the 9/11 National Grandparents Day card and 9/11 Patriots card all wrapped up as one card. So now as a Grandfather, I finally understood what God had wanted me to do.I just had to be patient for Him to bring me along on His schedule not mine. Ben Franklin the 7th generation grandson of our founding father Benjamin Franklin and I are asking for all Grandparents to Unite on National Grandparents Day bring your grandchildren, bring your children and for each family represented to have one "US" Liberty Stick with them as all of "US" We the People will go to God in prayer at exactly 9:11 am on 9/11/2016. Grandparents listen up, our next election will be critical in my opinion for all of "US" We the People. So as a Grandparent I ask you this question. What do you want for your Grandchildren? Do you want Socialism like we see across the ocean in Europe? Do you want Liberty and Freedom shinning brightly from Sea to Shinning Sea? For Ben Franklin and I, my family,and friends, the choice is simple, we choose Liberty. Restore our country back to the people for which it stands..... One Nation under God with Liberty and justice for All. Hope to see you at the Wall on 9/11/2016 at Sunrise and be with "US" ( We the People) at the Reflecting Pool when We symbolically throw the Anchor of Hope back to our God at 9/11 am. "Proclaim Liberty throughout all the land unto all inhabitants thereof"